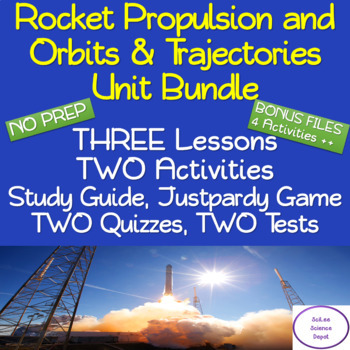 The STEM: Rockets Unit Bundle comes complete with THREE lessons, each one having a PowerPoint, illustrated Student Guided Notes, Teacher Notes, and a Worksheet with Answers. There are TWO Activities, TWO Quizzes, and TWO Tests. PLUS BONUS!!! 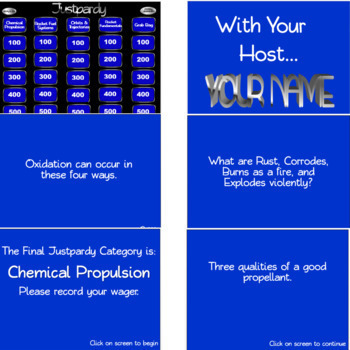 The BONUS File includes FOUR ACTIVITIES, 16 Five Minute Timed Daily Warm Up PowerPoints, and a Suggested Unit Plan. This assignment is a Video Reflection of the History of Rocket Technology with R. Lee Ermey - Lock'n'Load. The video goes over the history of rockets in a very entertaining way. This video is available on YouTube for free. The link is included with the download. This STEM hands-on activity demonstrates Newton’s Laws of Motion. Students experiment with a sling-shot like devise that throws a film canister filled with different objects. They explore to see how adding rubber bands and addition weight changes the distance the reaction block travels. 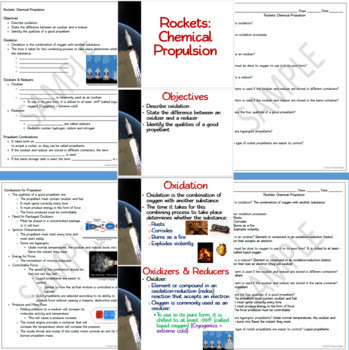 The Rockets Study Guide is two pages ling. The front page has 30 key Primate Vocabulary Words that the students need to define. The second page has 6 open response type questions the students need to answer. Set up tables in front of the classroom, 1 table per team. Divide the class up into 3-5 team, depending on class size. Have each student taking a turn coming up that teams table at the front of the class. Rotate, so each team gets to pick the Answer on the screen. Each team representative in the front of the class writes down their answer. For each correct answer the team gets a point. The team with the most points when the game ends wins. 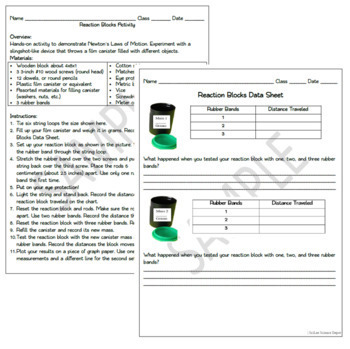 The Rockets Portfolio/Reflective Journal is an assessment tool where the STUDENT picks how they want to show you they have mastery of the subject. Use this item for your own classroom, students, or for you own personal use only. Buy additional licenses for others to use this product at a discount by visiting your TpT “My Purchases” page. Review this product to recommend to others to buy it in blog post, at professional development workshops, or other venues as long as credit is given to my store with a direct link to my store/product. Upload this product to any unsecured website or server that other teachers can access for free. Copy or modify any part of this document to offer others for free or for sale.